and if you have questions you can call me or email me. As a Chef I have never seen so many people butcher good food ,Take your time,if you don't have time ,make some. As the Johnson city press ask me a few years ago, what is the differance between Eropean foods and American,well my only answer was the differance is American food is just mest up European food.I cook every day for my family ,and everything it is freshly made from scratch ,It costs more to buy premade then it is to cook from scratch . This is a traditional Hungarian beef dish served over buttered noodles for a hearty, satisfying meal. The amounts of garlic, onions, and especially paprika may seem excessive, but they all melt into an incredibly rich and flavorful pan gravy during the slow cooking process. However, it is important that you use sweet Hungarian paprika, not a store brand. The sauce is further enriched by the addition of sour cream. You may substitute pork for the beef and/or rice for the noodles, if you wish. Place beef chunks in a large bowl. Sprinkle liberally with kosher salt and freshly ground pepper. Toss with the flour. Heat a heavy Dutch oven over medium high heat and add 1 tablespoon of the olive oil. Swirl to coat the bottom of the pan. Place beef chunks in a single layer and brown on two sides. You will probably need to do this in batches. Do not crowd the meat or it will boil instead of brown. Remove browned beef chunks to a bowl. Reduce heat to medium-low. To the drippings in the Dutch oven, add the remaining 2 tablespoons of olive oil, sweet onion rings, mushrooms, and garlic. Toss to coat with the olive oil. Cover tightly and sweat the vegetables, stirring occasionally, until onions are limp but not browned and mushrooms are releasing their liquid, about 10 minutes. Add red wine to the vegetables and cook 2 minutes, scraping up browned bits from the bottom. Add beef broth, roasted red peppers, and paprika. Return beef and any accumlated juices to the pan. Stir until well-combined. Cover tightly, reduce heat, and simmer on low heat for 1-1/2 to 2 hours, stirring occasionally, until beef is fork-tender. Remove Dutch oven from heat and wait for boiling to subside. Taste and add additional salt if necessary. Stir in sour cream until completely incorporated into the gravy. Serve Hungarian goulash over hot buttered noodles with chopped parsley. Note: The amount of paprika is correct. Please do use it all. If you cannot use the wine, use an equal amount of additional beef broth. 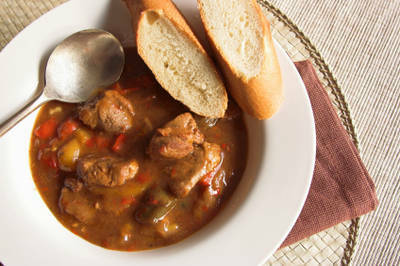 The goulash may be refrigerated or frozen, before the addition of the sour cream. Reheat and stir in the sour cream just before serving. And please dont put hamburger meat in it. And if you never tried Hungarian sausage or cheese ,you are missing something great . Heat the oil or lard in a large pot (preferably a Dutch oven). Add the onions along with a few spoonfuls of water (so they don’t brown) and a pinch of the salt. Cook slowly over very low heat for about 15 to 20 minutes, or until the onions are clear and glassy. Remove from the heat and add the paprika, pepper, and caraway seeds. Stir quickly to combine and add a tiny bit of water (to prevent the paprika from burning). Add the meat and garlic and cook over high heat, stirring, until the meat is slightly browned (about ten minutes). Turn the heat down to low, add a few spoonfuls of water, and cook for about 15 more minutes, until the meat is nearly cooked through. Add the water and keep cooking, over low heat, for at least an hour, or until the meat is cooked and nearly tender enough to serve. This could take hours, depending on the cut of beef you used. When the meat is nearly done, add the tomatoes, carrots, parsnips, and potatoes and cook for about 15 more minutes, or until they are tender (being careful not to overcook them). Taste the soup and add more salt and pepper, if needed.